At CMS, as WOTC experts and service providers since 1997, we receive a lot of questions via our website. In the case of the above question, the sender did not provide their email address, so we were unable to reply directly to them. So, hopefully using our blog, we can reach the writer of the question, and hopefully will help others too. 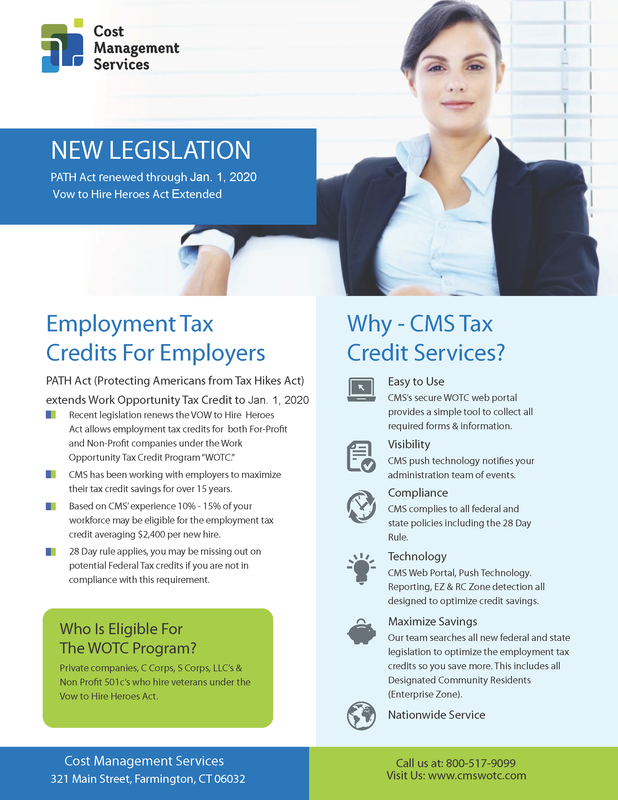 Although Work Opportunity Tax Credit WOTC is a federal program, it is administered at a state level via State Workforce Agencies who handle the review, processing and distribution of certifications (or denials). State Agencies require employers, or service providers like CMS, submitting WOTC applications to them to do so within 28 days of the employee’s start date. This is to ensure timely processing of qualified applicants due to the large volume states receive. In the instance of the above question, although the employee was a disabled veteran, who may very likely have qualified for up to a $9,600 tax credit under the WOTC program, the employer has left it too late to apply. The individual was hired on 11/28/2016, and the question was submitted to CMS on 1/30/2017, making it 63 days after his start date. By not submitting your WOTC applications within the 28-day time frame you can easily miss out on thousands of credits. Going forward include the WOTC paperwork as part of your onboarding process. When you hire someone new and have them complete their I-9, W-4, Employment Agreement etc. include the 8850, and 9061 forms. To prevent any potential discrimination include the forms for ALL employees, not just the employees you think will qualify. In our 20 years of performing WOTC Screening and Administration we’ve saved millions for our customers. Contact CMS today to start taking advantage. Call 800-517-9099, or click here to use our contact form. This entry was posted in WOTC News and tagged Work Opportunity Tax Credit, WOTC, wotc 28 day rule. Bookmark the permalink.